Tonight when I sat down to do this rendering, I fully intended to do a really quick design. I started with my shape templates and quickly laid out the hexagon and rectangle. The two shapes combined looked very Art Deco to me, so I decided to follow this design vein. As I started filling in the diamonds and faceted onyx, I was bothered by a lack of balance. 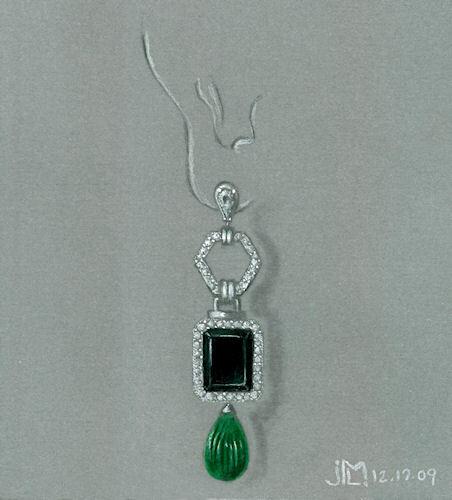 After I had finished the rendering, I couldn’t leave it and went back and added the pear-shape faceted emerald drop. Time stands still for me when I design and paint. Since this is one of the only times during the day when I’m happy to sit still and my mind is quiet, I see these designs as a form of meditation, as well a chance to further my design and rendering techniques. These designs are my own way, too, to offer a daily gift to my readers and maybe bring a tiny bit of beauty into both our worlds.